A new solo exhibition by Miguel Chevalier is on display at Galerie Lelia Mordoch in Paris. Machine Vision 2019 runs from 29 March to 25 May and features digital artworks, sculptures and screen-printed works by the artist. The exhibition extends the work begun in Artistes et Robots, a 2018 group show at the Grand Palais of which Chevalier was Artistic Director. Both exhibitions engage with a thread of research Chevalier has followed for over thirty years; the influence of computation on contemporary image-making and the materiality of the digital image. As physical, tangible materials are increasingly represented in the realm of the digital, simultaneously a kind of digital materiality emerges as the influence of algorithms ripples outward. 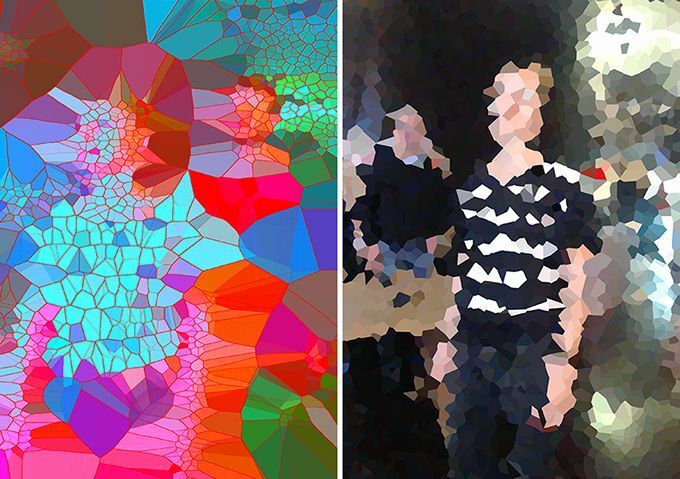 In Machine Vision 2019 Chevalier turns his attention to geometric algorithms, notably the voronoi diagram and Delaunay triangulations. Central to the exhibition is a two screen installation piece titled L’oeil de la machine which examines the concept of the digitised body. When visitors move in front of the screens they see, and can interact with, a digitally tessellated version of themselves, generated in real time as video recordings of the gallery are processed by geometric algorithms written by algorithmist Claude Micheli. The work is conceived of as a human-machine performance in which human and algorithmic ways of seeing and processing information interplay. Physical and digital entities become enmeshed, part of a network of ebbs and flows. In L’oeil de la machine images are constantly generated; culmination is replaced by saturation, echoing the contemporary condition of image-making and image-sharing. This is the age of infinite representations. Chevalier explores this condition with a group of sculptures and video pieces which examine the infinite loop. In the video pieces, the infinity symbol undergoes various transformations; the loop never breaks, the image never ends, human concepts of time are suspended. In the Dacryl sculptural works, the physical forms have no beginning or end; rather, our understanding of them changes depending on perspective. This group of works links the pixel and the physical form, and brings to the fore the self-generating quality of algorithmic artworks and computation more generally; both follow temporal and spatial rules distinct from, and intertwined with, those followed by humans in past eras. Also showing in the exhibition are a series of static self-portraits using Voronoi diagrams, which are screen-printed on Dacryl. These works extend the work of artists such as by Rodin or Giacometti, who examine the human condition through studies of mobility, into the 21st Century. Machine Vision is at Galerie Lélia Mordoch, 50 rue Mazarine, 75006 Paris from 19 March to 25 May.